Mainstream Isn't So Bad...Is It? : Salsa caliente! "It never fails. The mere mention of 'Fania' is guaranteed to bring a sweet smile of recognition to Afro-Caribbean music aficionados. The New York-based record company defined an era. It is rightfully known as 'the Latin Motown' but it is much more than that. It was solely responsible for developing and defining the essence of an entire genre. Fania is without doubt the most important record label in the history of Latin American music." -from the liner notes to Salsa Explosion! So winter is here for real in New England, and with it comes single degree temperatures and snow. To help fight off the cold and the profusion of holiday music assailing our ears, what better cure than a spicy mix of salsa? And if you're going to spin some salsa, then were else should you turn but THE latin label extraordinaire: Fania! I've mentioned Fania before: with several Tito Puente releases (here and here), a Gilles Peterson compilation, and a remix collection. Well now, one of my favorite labels, Strut Records, has teamed up with Fania for a new series of releases called Fania Essential Recordings. 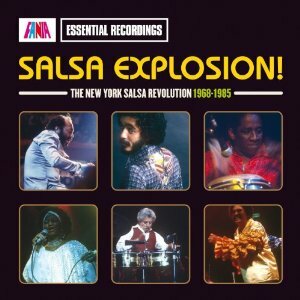 The first album in the series, Salsa Explosion! The New York Salsa Revolution 1969-1979, came out a few months ago and is chock full of some seriously spicy salsa music (say that fast ten times). Below you can grab Ahora Es El Tiempo (Now Is the Time) from arranger, composer, and vibes player Louie Ramirez. Other artists on the compilation include some familiar names (the above mentioned Tito Puente - who would always deny that salsa music even really existed - as well as Willie Colón and Joe Cuba) as well as some artists not so well known outside Latin circles. To accompany the music are previously unpublished photos and brand new liner notes. It's a great introduction to a vibrant musical form! If you want to dig a little deeper after buying this one, check out Salsa: A Musical History, which is a four disc set that ranges a little further. Visit the album's official site and its label Strut Records.